KPN delivers mobile, landline, TV, and internet service to millions of customers in Europe. Facing fierce competition in all of these areas, KPN is under constant pressure to offer a world-class experience to both its B2C and B2B customers. This challenge is what led KPN to launch a customer community in 2012. Recognizing that consumers sought fast, simple self-service options, KPN designed its community to serve as a digital knowledge base for its customers. Today, 45% of the customer questions in KPN’s community are answered by other KPN customers. Because so many community visitors are able to find the answers they need, KPN deflects hundreds of thousands of support calls - and saves an estimated $4 million - each year. KPN also uses its community for product research and co-creation. By gathering feedback on its products and user documentation, KPN gains new insight into customer preferences and is better equipped to respond to customers’ needs. But KPN’s community success didn’t happen overnight. It laid the groundwork with the right activation and content-creation strategies, and made a special effort to drive traffic to the community and keep it growing. Which steps did KPN take to make its community a success? KPN turned to inSided to power its customer community. With inSided, KPN gained a streamlined, user-friendly community, as well as a dedicated team of product specialists to optimize the community’s design and day-to-day operations. Plus, inSided’s Salesforce integration allows the KPN digital team to create cases and look up customers’ contact history from the community moderation environment. The inSided platform makes it easy for KPN to surface the right answers to customer questions. Where the real value of the community lies is that it is both a 1-to-1 and a 1-to-many service channel. When we help a customer on the community, we’re actually helping 50, 60, or 70 customers. 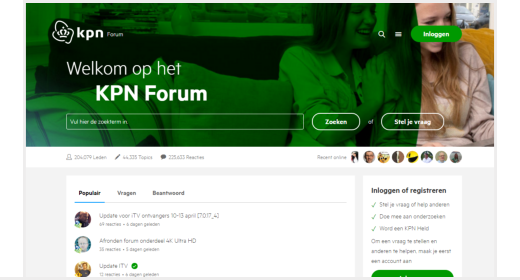 As KPN launched its community, it sought to build a critical mass of user traffic by pointing to the community from other KPN platforms. The company used inSided’s API to ensure community posts would be indexed by the search engine on its website. It also shared community conversations on its Facebook page. KPN leveraged its own staffers to seed activity on the new community platform, as well. Digitally savvy KPN employees stay active within the community to ensure that customers receive prompt answers to their questions. A major factor in the KPN community’s success has been identifying “super users” - community members who go above and beyond to respond to questions and make contributions. inSided’s gamification tools are essential to the KPN super user program, Thomas notes. 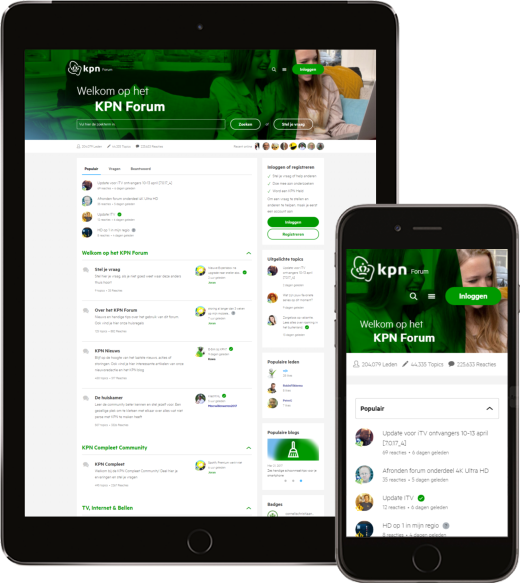 KPN assigns “badges” when users create topics, write comments, and provide answers, incentivizing participation and rewarding meaningful activity. Due in large part to this gamification strategy, one-third of the content on the community is created by KPN’s 20 super users. 95% of our customers exceed KPIs. Join the world's leading brands and scale customer success with inSided. Discover how leading brands use online conversations and customer communities to improve their business & influence customer experience. With a little help from us, T-mobile runs the largest telecom community in the Netherlands. About 40% or all support requests are handled by their community. Sonos uses inSided to adopt a peer-to-peer support strategy. Today, their community is the starting point for customer care on multiple digital channels. Soundcloud leverages their 175 million monthly users to provide relevant answers in a highly scalable way and provide great support without increasing their headcount. Want to see what inSided can do for you ? It's a great chance to have a closer look at our platform.